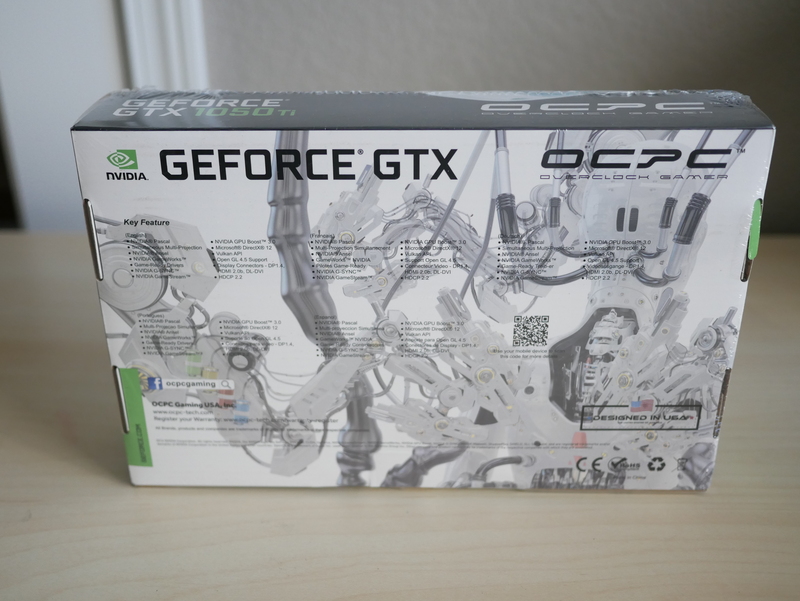 OCPC Gaming may seem like a newcomer to the PC gaming community. The company is USA based and has been providing memory solutions since 2007. The company makes SSDs, Memory, PSUs and even Nvidia and AMD GPUs. 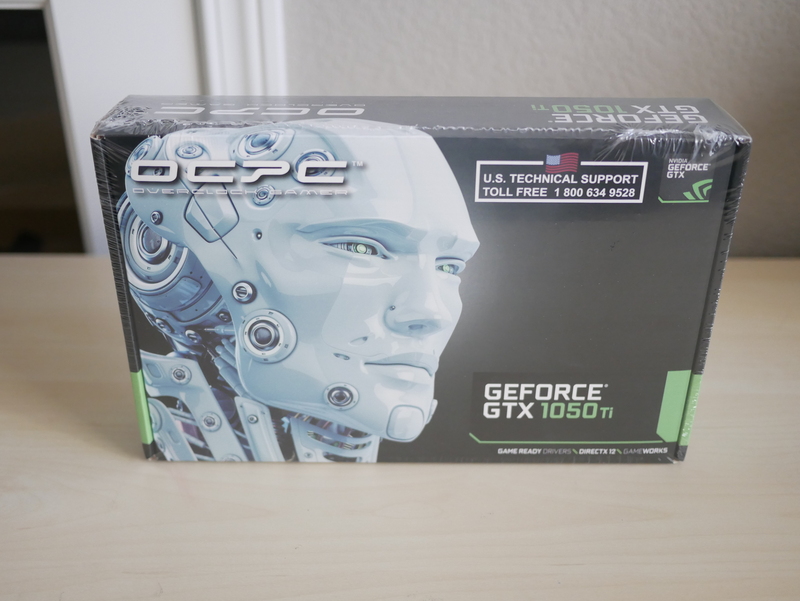 Today, we will take a look at an Nvidia GPU, the OCPC GTX 1050ti 4gb. 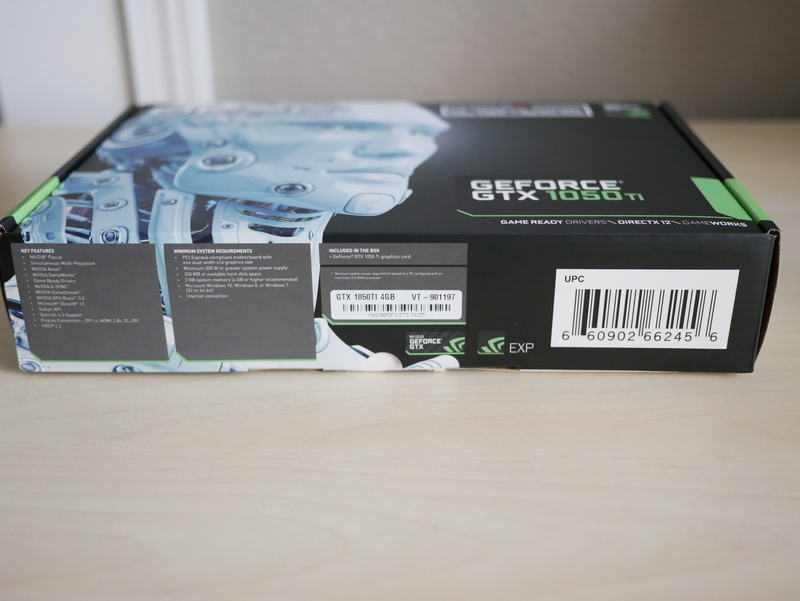 Starting out looking at the outside of the box, you have a unique robot design, the OCPC logo and the Nvidia information stating it’s a GTX 1050ti. 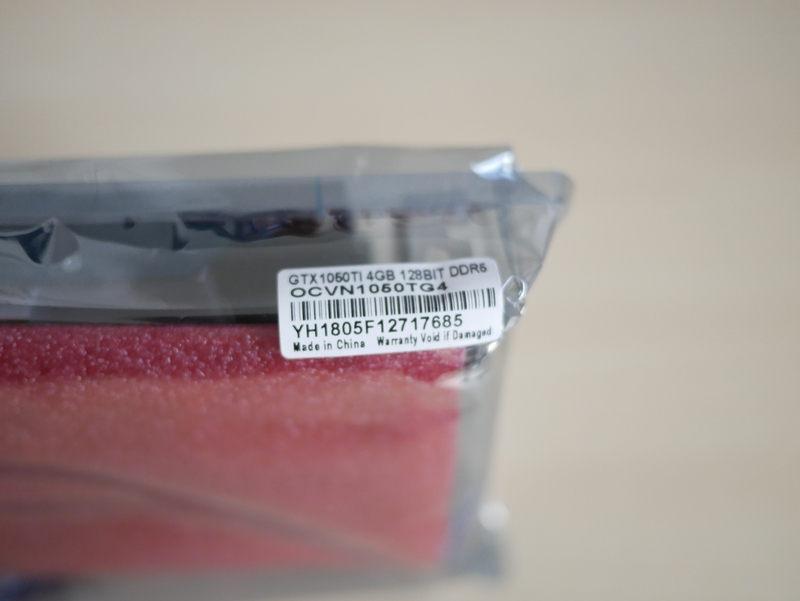 You also notice that the box is sealed with plastic wrap. 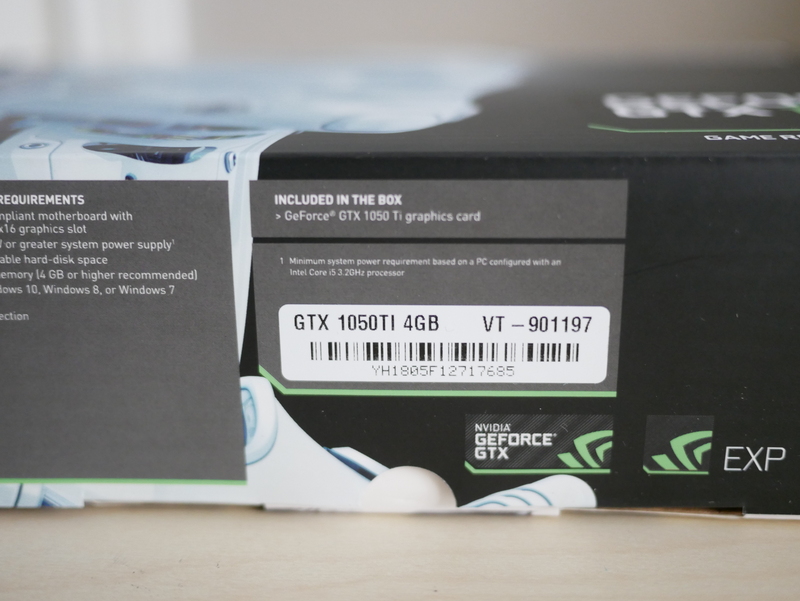 The bottom of the box displays some of the key features of the GTX 1050ti and the minimum system requirements. 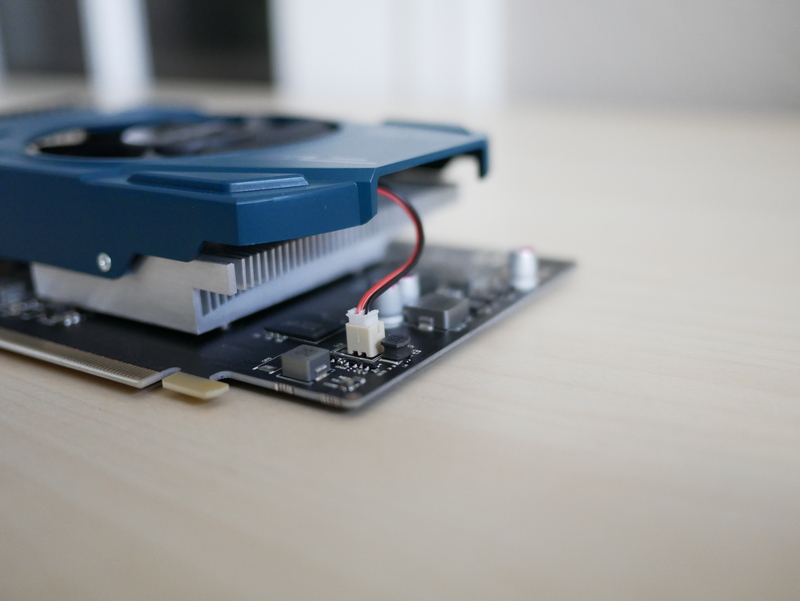 This card requires a minimum 300W power supply to adequately power the card and the rest of the components for the computer. 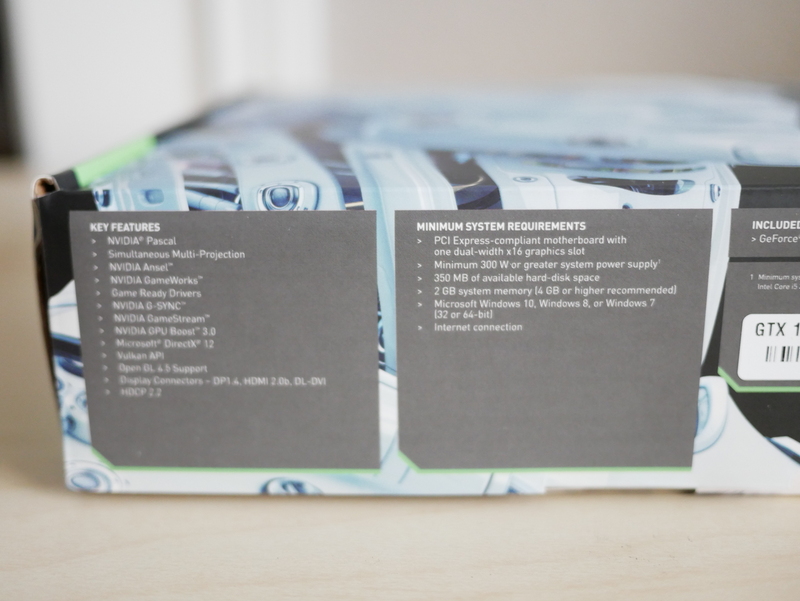 The back of the box displays a continued robotic theme as the front and lists several features of the GTX 1050ti. The small black text can sometimes be difficult to read. 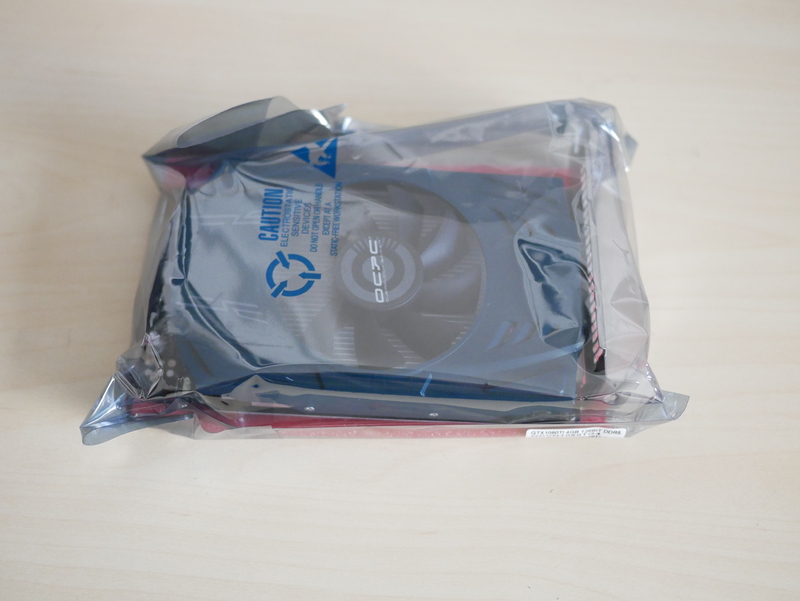 Opening up the inside of the box you notice the GPU covered with some red bubble wrap and the nonlabelled driver CD. 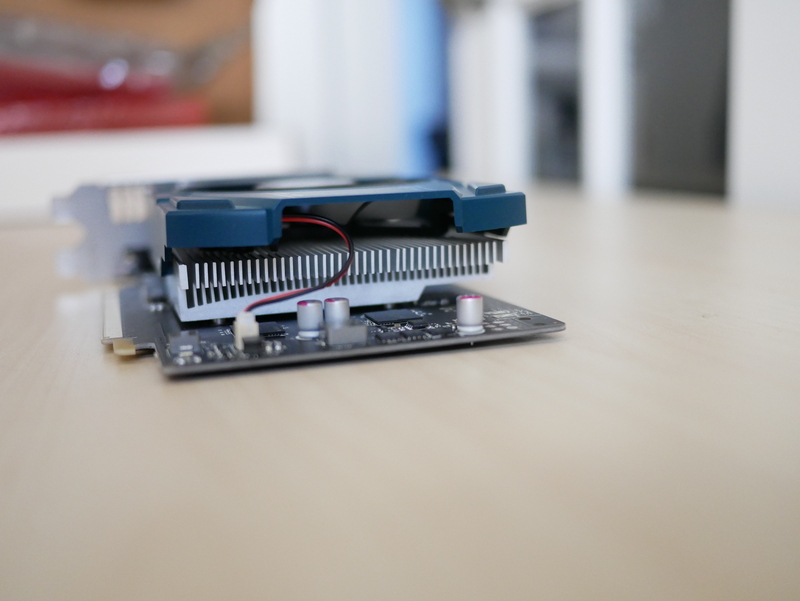 The card is not heavy but I suggest either providing another cardboard insert to prevent the GPU from sliding around in the box or adding a slit in the cardboard insert to place the end of the I/O bracket on the GPU. I suggest either labeling the driver cd or just to not include it overall. The most up-to-date drivers can be found on the Nvidia website. 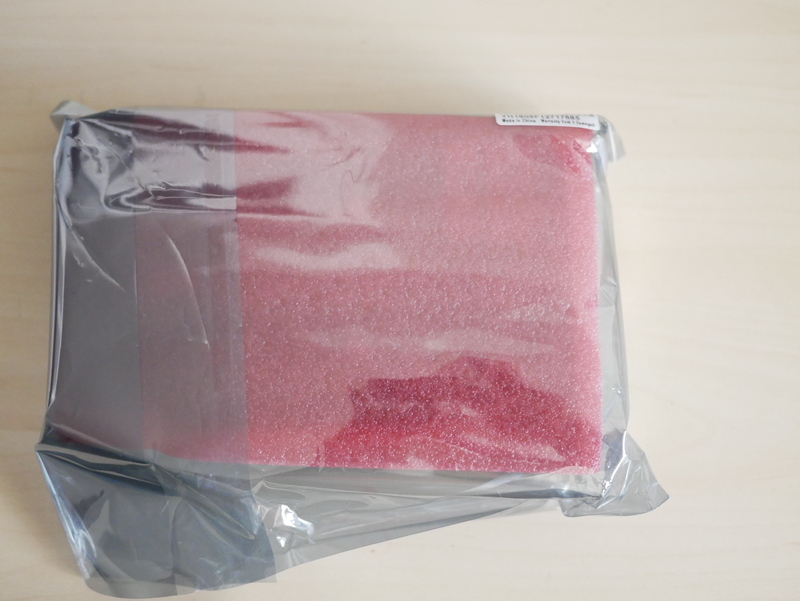 The OCPC card is still packaged inside an anti-static bag. Taking a look at the exterior of the OCPC GTX 1050ti, the card has a nice metal teal shroud. 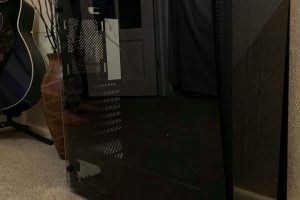 The shroud design to me looks similar to either Galax or Zotac. Overall is simplistic and a decent teal color which is not overpowering and not bothersome. 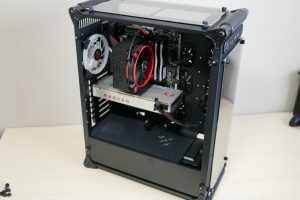 In the center is a 72mm cooling fan with the OCPC logo on it. The shroud is small and it does not even reach the end of the PCB, making a very compact design of the card. Through the shroud you can see the aluminum fin stack that has a very basic design. 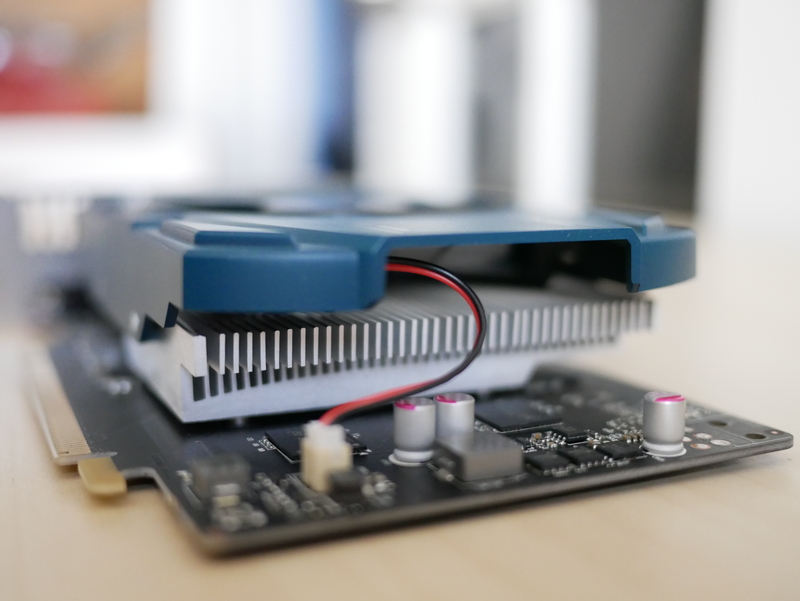 Since it is a solid heatsink plate, air from the fan will hit the heatsink and be deflected and pushed out in all directions, unlike some fin stacks that allow air to pass through the fins to be directed at the PCB underneath. This is a fine design because the card and components overall don’t provide much heat. 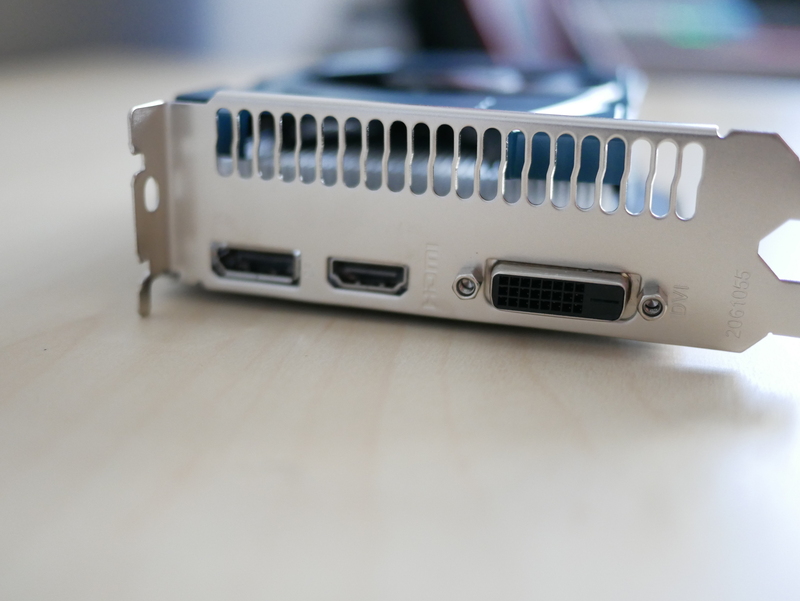 The I/O of the card is a DisplayPort, an HDMI port and DVI – D port. There card did not have any covers for the I/O ports or the PCIe port. The bottom of the GPU is the bare PCB, there is no backplate included. It is not necessary as the card does not create a lot of heat and does not weigh a lot due to a large fin stack. From the rear of the card you can see the OCPC 1050ti uses a 3-stage power delivery to provide power from the PCIe slot for the GPU. There is also a single SLI finger to be able to SLI two 1050ti’s together. 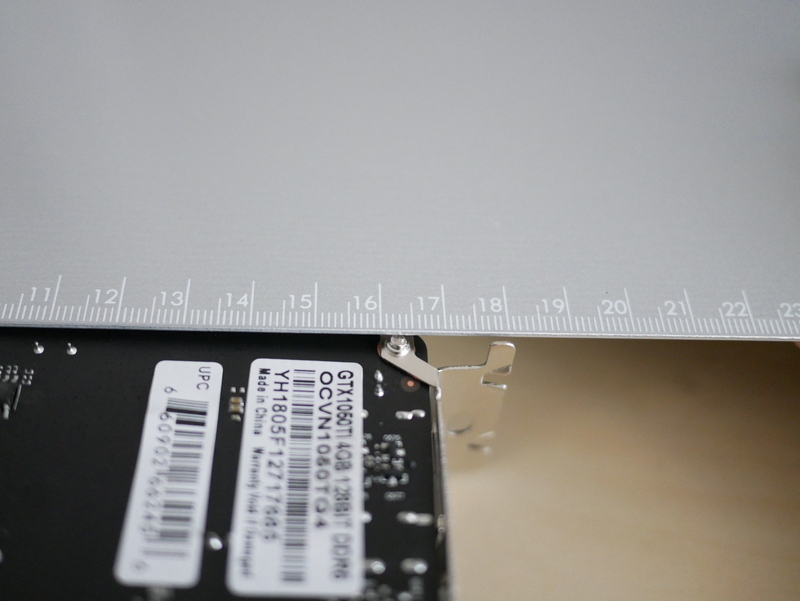 The length of the card is approximately 181 mm, allowing it to be put into almost any small ITX case. Cinebench R15: This is a great test to consistently test your GPU. Unigine Valley: A great consistent GPU benchmark that can test your whole system. Unigine Heaven: A great consistent GPU benchmark that is awesome for testing your GPU stability and temperatures. Tomb Raider: A classic game that is consistent and can easily be used to test the stability of your GPU. Dirt Rally: A pretty long benchmark run, the race allows the display of many different textures along the track and can adequately test a GPU. Ashes of the Singularity CPU Test: The GPU test is used to place a great gaming load on the GPU with lots of calculations being made with the many units on the screen during the test. Installation was simple and straight forward. Insert the card in the PCIe slot and that is all, no need to add extra power plugs. The following are what I believe to be a great group of benchmarks used to test your GPU. Some of these games do cost money, a few tests are free to the public such as Unigine Heaven, Unigine Valley, 3DMark Firestrike and Cinebench R15, download and compare your results. 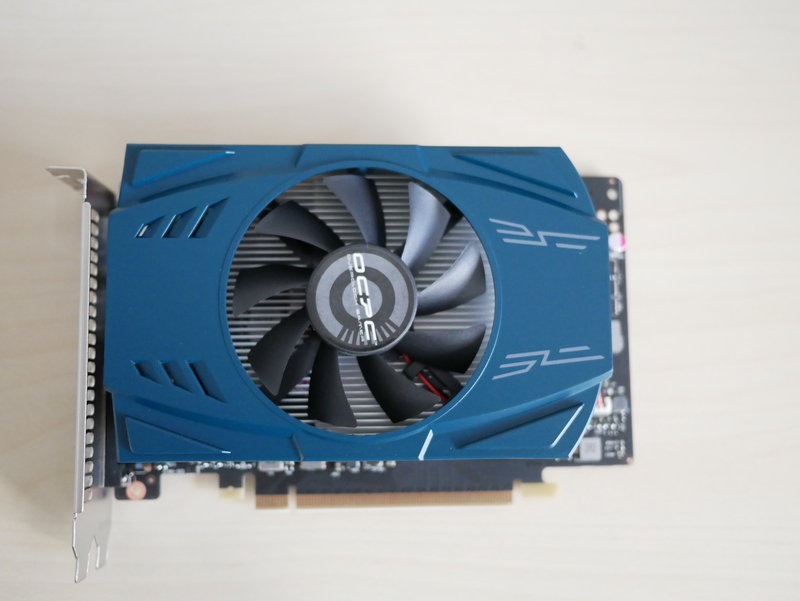 The OCPC 1050ti is being compared against an MSI GTX 1050ti 4GB OC card. The MSI card has a higher boost clock out of the box and is able to clock slightly higher with GPU boost 3.0. This could be because MSI binned the chip. The MSI card leads the OCPC card by a few FPS, but this shows that potential binning allowing the higher clock speed, proved to provide a better score. The scores are relatively close and this shows the OCPC card puts up a great fight. The OCPC GTX 1050ti does really well keeping up with the MSI 1050ti. The MSI edges out the OCPC card by a little bit. The MSI 1050ti was able to boost its overclock to 50 MHz higher than the OCPC while both maintaining 58 deg Celsius. Tomb Raider isn’t hard on modern cards. Both 1050ti’s were able to perform great pulling in about 121 FPS. Rise of the Tomb Raider is a fairly new game and is hard on GPUs. Both card performed the same at around 57 FPS. Dirt Rally is a little older title. The MSI card did a little bit better, and the extra clock speed could be a result. The last test is Ashes of the Singularity which is really hard on hardware. The GPU test really tested both GPUs. The OCPC 1050ti actually beat the MSI 1050ti. 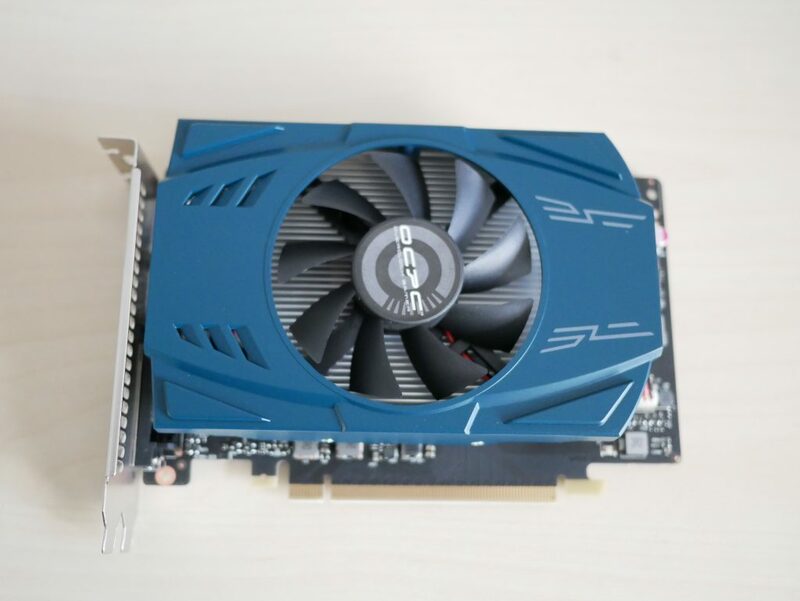 Bottom Line Overall, this GTX 1050ti has a great design and no major issues. 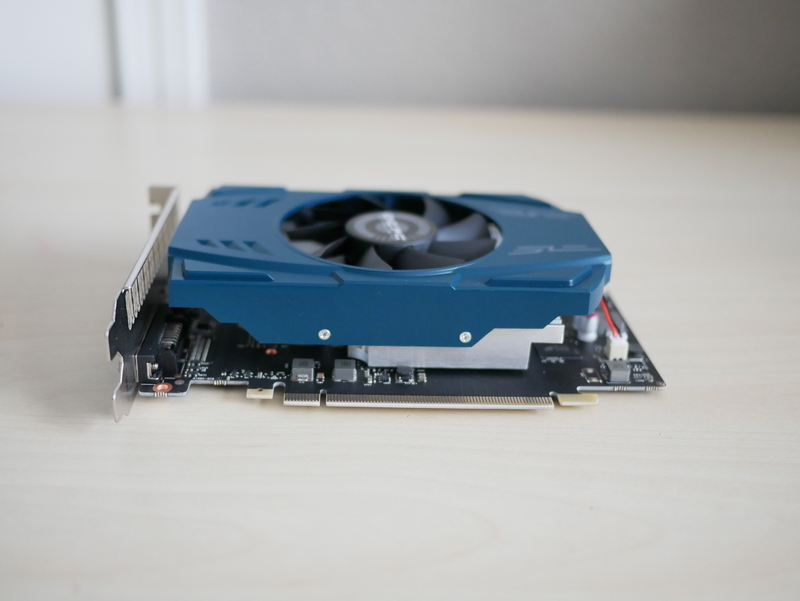 Without being a binned GPU chip, this OCPC designed card keeps the GPU cool and it performs well compared to the big names in the GPU market.